Production of hundreds of household goods banned in Britain. All Germans and Austrians living in UK ordered to surrender their wireless sets. Air raids along many parts of East Coast of England. U-46 sinks the British armed merchant cruiser Carinthia off the west coast of Ireland. German tanks in groups of 200 300 break through French line in two places on Somme front and Rommel’s 7th Panzer Division advancing to the West of Amiens, penetrates 20 miles into French territory. During these breakthrough’s the Germans suffer heavy losses at Amiens and Petonne. Hitler issues a directive for the implementation of the Kommissarbefehl (Commissar Order) which calls for the summary execution of all Soviet political commissars attached to the Red Army. This order is tacitly disobeyed by most German army and corps commanders who deem it contrary to German military custom and tradition. Act authorizing acquisition of idle foreign merchant ships by the US is approved. A German bomb, undiscovered for 13 months explodes. 19 people are killed, more than 50 injured and 300 families made homeless. German troops execute every male in the Czech village of Lidice (Bohemia) and then set fire to village in response to Heydrich’s death. 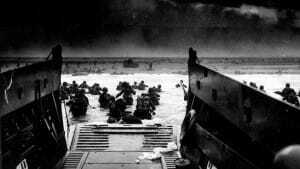 Before dawn, the Allied Expeditionary Force of British, American, Canadian, Polish, and Free French troops begins Operation Overlord, the long-awaited invasion of France. After an intensive naval and aerial bombardment, the first wave of 5 divisions (156,115 men) are landed at designated beaches in Normandy named Sword, Juno, Gold, Omaha and Utah. This is preceded by the British 6th Airborne Division which lands near Caen and some 12,000 paratroopers of the US 82nd and 101st Airborne Divisions which are dropped on the Cotentin peninsula. These forces are supported by 1,213 warships, including 7 battleships and 23 cruisers, 1,600 auxiliary ships, and 4,126 landing craft, as well as massive British and American air support, which flyÃ­s 14,674 sorties that day. Opposing them in their bunkers and on the beaches are 5 German infantry divisions with about 50,000 men and 100 tanks and assault guns. 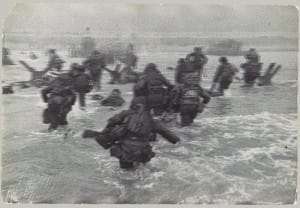 Despite some heavy casualties, especially by the AmericanÃ­s on Omaha Beach, the German defenders, stunned and surprised by the massive onslaught, are progressively overwhelmed, and most of the allied objectives are reached and secured by nightfall. There is very little opposition from the Luftwaffe or Kriegsmarine. The West Point Class of 1944, which includes John S.D. Eisenhower, son of the Allied commander in chief, graduates as the Allied landings are in progress in France. Young Eisenhower is immediately whisked to his father’s headquarters in England, but his request to command a rifle platoon is turned down because of the risk that he might fall into enemy hands. Fleet Admiral William D. Leahy, who was effectively functioning as chairman of the Joint Chiefs of Staff (a position that would not be formally created until after the war), visits his hometown of Hampton, Iowa on a well-publicized “sentimental journey” to see relatives and old friends. It is part of the deception effort to convince the Germans that the invasion of Europe would not take place while such an important officer was out of Washington. The Royal Navy loses the Destroyers Wrestler and Svenner, which was Norwegian. The French take Tivoli in Italy. 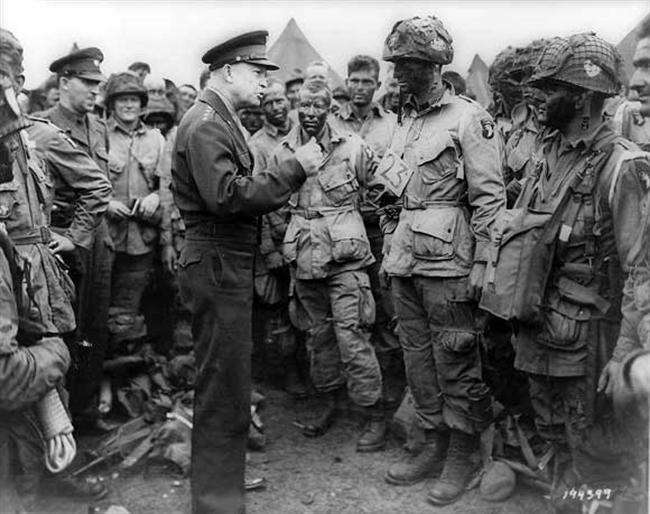 The Anniversary of D-Day, sees Eisenhower order a holiday for troops in Europe. Allied casualties from D-Day to VE-Day were 776,967 of which 141,590 killed. Naha airbase on Okinawa is now being used to hit Japan.